What if Following Your Heart Meant Losing Your Soul? Split. After being inexplicably targeted by an evil intent on harming her at any cost, seventeen-year-old Nikki finds herself under the watchful guardianship of three mysterious young men who call themselves halflings. Sworn to defend her, misfits Mace, Raven, and Vine battle to keep Nikki safe while hiding their deepest secret—and the wings that come with. A growing attraction between Nikki and two of her protectors presents a whole other danger. While she risks a broken heart, Mace and Raven could lose everything, including their souls. As the mysteries behind the boys’ powers, as well as her role in a scientist’s dark plan, unfold, Nikki is faced with choices that will affect the future of an entire race of heavenly beings, as well as the precarious equilibrium of the earthly world. she’s the central force of a madman’s plan, and turns to three half-angel boys for protection. With the Halflings, she’s completely safe, except her heart. And Mace’s soul. Falling for him could ensure his eternal ruin. I was quite intrigued by this first book of the Halfling Trilogy. Author, Heather Burch takes the struggle between good and evil and makes it into a wonderful story of danger, forbidden love, and teenage woes. I love the characters in this story. Nikki is a somewhat normal, mixed up tomboyish, teenage girl. Her best friend Krissy is the usual girly girl, who would love to glam up her tomboyish friend. Unfortunately these girls find themselves intrigued by the three new "hot" guys at school . . . guys happen to be half-angel, half-human. . . halflings. It is forbidden for them to love a human. . . actually to choose a human over their duty to Heaven would cost them their soul. The exciting twists and danger in this story, as well as the character's individual personalities kept my interest from start to finish. The emotional love triangle kept me guessing and wondering . . . what would I do? The parental issues, and personal struggles Nikki has to deal with just make it that much more believable. Although there is an internal spiritual struggle going on with a few of the characters, this book is not preachy and can be read by christian fiction lovers as well as those who are not fond of preachy books. Great clean fiction YA story. 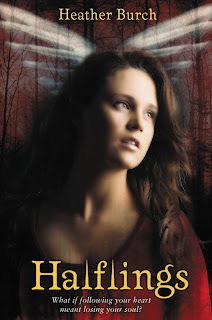 A well-written, kept my interest, YA paranormal novel. I look forward to reading what happens next! I plan to read more by author Heather Burch in the near future! Heather Burch grew up in Branson, Missouri, where she learned to love fiction. She then married into a family of published novelists and quickly learned writing was her heart’s desire. When she’s not working on her latest book, Heather can be found watching a sunset at a beach near her home in Southern Florida, along with her sons Jake and Isaac, and husband, John—who is her hero in every way. * I received a free digital copy of this book through Netgalley for this review. All reviews are my personal opinion. See my Policy & Disclosure page for more info. I don't tend to read a lot of "angel" books because I never know the direction they are going to take and whether they will be totaly out there as far as God or anything is concerned. I like that you wrote: "Although there is an internal spiritual struggle going on with a few of the characters, this book is not preachy and can be read by christian fiction lovers as well as those who are not fond of preachy books." It makes me more open-minded to the book. Thanks for your review! I haven't heard of this book before it sounds really good definitely something I would pick up!